Nike C10 heart rate monitor is an intermediate heart rate monitor in the Nike Triax series designed for running training. It is almost the same as the Nike C8 except that it does more of some important features. This will become clearer in what follows. Important Note: The Nike C10 is obsolete. 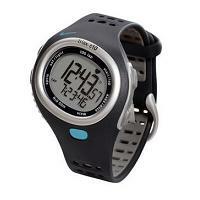 Please take a look at the Timex Ironman Race Trainer, it has similar features. You can now train inside a heart rate zone by setting your upper and lower heart rate limits. You can turn on an audible alarm which beeps when your heart rate goes outside of your zone limits. There are also visual out of zone indicators. You can store lap and split time. Lap time is elapsed time for one lap. Split time is total elapsed time from the start. You can store up to 100 laps in total. Your average heart rate in a given lap is also recorded. YOu can customise the display so you see only the information you want during your exercise. If you have taken laps, you can review your average lap time and best lap. Furthemore, for each lap, you can see your split time, lap time and average heart rate. You can store training data from multiple sessions. A Five segment countdown timer. Use it for running intervals. Power Save feature: You can set the time after which the watch will go to sleep i.e. the display goes off to save battery life. Wake up the watch up by pressing any button. Note that the features in bold above show the differences in features between the Nike Triax C10 and the Nike Triax C8. You can see that the C10 adds not much at all to what is already on the C8. The one main change is the use of digital wireless transmission instead of an analogue one. The Nike C10 heart rate monitor has increased the number of laps you can take in each run from 50 (on the C8) to 100. You can now set a five segment countdown timer as opposed to two on the C8. There is one enhancement to this timer facility. Just as with the C8, you can set each segment as a timed interval. Nothing new here. However, with the C10, you can also set a specified heart rate reached as the end of the segment. For example, you can set segment 1 to end when you heart rate reaches 170, segment 2 to end when it reaches 130, segment 3 to end when it reaches 175 and so on. This is a heart rate based (instead of the traditional time based) interval training. The wireless transmission for the Nike C10 heart rate monitor has now changed to digital instead of analogue. What this means is that it eliminates crosstalk (i.e. signal interference from other heart rate monitor users). The transmitter and the wrist watch now use a single unique digital ID to communicate with each other. If you are likely to exercise or run in close proximity of other heart rate monitor users, then this can be an important feature for you. The big news is that the Nike C10 heart rate monitor brings in digital transmission technology to the Triax series. Otherwise its feature list is very similar to that of the Nike C8. Next one up in the Nike Triax series is the Nike Triax CV10. It is a significant upgrade as it brings in speed and distance measurements for your runs.